With Stephen Strasburg's recent signing of a $175 million contract, the publication of the seemingly Tobacco Institute inspired The Arm by Jeff Passan, and it looking like his pitching mechanics are again taking their toll on his arm, I thought it was time to revisit the topic of Stephen Strasburg's pitching mechanics and why they continue to cause him problems. When it comes to Stephen Strasburg's pitching mechanics, the thing that most likely comes to mind is the infamous arm action with the pretentious name. What the not so durable guys do is they take their elbows back but they also take them up. Now, that's painful to do, but it's not that bad in and of itself. The problem is that when you take the elbows back and up, you can end up with a Timing problem. In other words, and contrary to what Jeff Passan says in The Arm, I do not believe the Inverted W is the root cause of Stephen Strasburg's problems and have said as much since at least 2007. The root cause of Stephen Strasburg's problems is a concept that is behind much of the pitcher injury and Tommy John surgery epidemic, and I'm not talking about the Inverted W.
When I talk about Timing, I'm referring to the position of a pitcher's arm when their shoulders start to rotate (which is often, but not always, at foot plant). If you look at Stephen Strasburg's pitching mechanics, what stands out is his pronounced Inverted W.
Yes, it can be painful to take one's elbows both up and behind the back as Stephen Strasburg does. I know that, after an hour of talking about the Inverted W, my shoulders inevitably end up aching. However, simply making the Inverted W isn't that bad, in and of itself, as long as there's no rotational load on the shoulders. You can see by focusing on the letters on his chest in Frame 17, Frame 18, and Frame 19 -- as Stephen Strasburg passes through the Inverted W position -- that his shoulders aren't turning. That means the rotational load on his elbows and shoulders is minimal at this moment and the Inverted W likely isn't causing any problems. The problem with the Inverted W is that it can -- and I mean CAN and not always DOES -- put the pitching arm in a bad position when the shoulders start rotating. The increased blurring of the letters on his chest and the disappearance of the placard down the middle of his jersey tells us that Stephen Strasburg's shoulders start rotating in Frame 20 while his arm is flat and parallel to the ground. I call this Flat Arm Syndrome, and it's a particularly serious type of Timing problem. The problem with this movement pattern, and the reason why I use the term "syndrome," is that it will often overload the pitching arm. That will usually produce a quick velocity boost, which is why people like Tom House teach it. However, what Tom House hopefully doesn't realize -- and in the worst simply doesn't acknowledge or discuss -- is that by creating a Timing problem and overloading the arm, you are significantly increasing the risk of injury. In Frame 21, it becomes obvious that Stephen Strasburg is pulling hard with his glove side. The movement of the letters on his chest tells that this is causing his shoulders to rotate. However, his pitching arm still hasn't externally rotated more than 15 or so degrees. As a result, in Frame 22 Stephen Strasburg's pitching arm rapidly externally rotates and pops up into a vertical position. I believe this is problematic because, at 90 degrees of external rotation, his pitching arm is in its most vulnerable position -- the lever arm is the longest -- at the same time that his shoulders are at their peak rotational velocity. That places a tremendous load on both his Ulnar Collateral Ligament, his Rotator Cuff, and his Labrum. If you were to look at a still picture of Stephen Strasburg at the same moment in time as Frame 22, you might get the impression that his Timing is good and that he's at what I call the Ready Position. However, the existence of a problem is tipped off by how far his pitching arm side elbow has moved relative to its point of maximum scap retraction (scap load) and how much his glove side elbow has pulled. As Stephen Strasburg's shoulders continue to rapidly rotate -- look at how far his pitching arm side elbow moves between Frame 22 and Frame 23 -- his arm continues to externally rotate and lay back toward second base. Of late, Stephen Strasburg's Inverted W has morphed into more of a Horizontal W. However, I don't see any improvement in his Timing. His going only from the set position also hasn't helped any. Stephen Strasburg and the Nationals came through St. Louis in June of 2014 and, since he seemed to be relatively healthy, I went down to the stadium to shoot some video and see if anything had changed in his pitching mechanics that would cause me to change my opinion of him. Unfortunately, I don't see any significant change in Stephen Strasburg's pitching mechanics or his Timing. 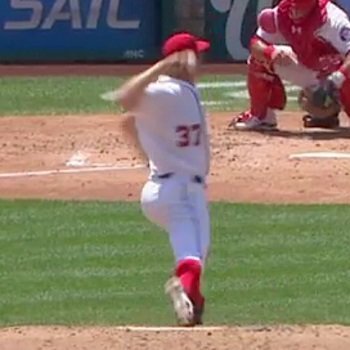 If you watch Stephen Strasburg's pitching arm, you can see that his pitching arm starts rotating -- the elbow of his pitching arm starts moving to the left, which means his arm is under load -- while his pitching is flat. You can also assume that Stephen Strasburg's Timing is even worse in games, which means he remains a significant injury risk. I've continued to publicly (via Twitter) express concern about Stephen Strasburg's pitching mechanics, most recently in this tweet on July 21, 2016. Note Stephen Strasburg's continuing problem with his front side opening and his shoulders rotating while his pitching arm is at best just a tick above flat, which is the definition of Flat Arm Syndrome. You can see the same pattern in the next to last pitch that Stephen Strasburg threw last night, which is the pitch when something happened. While Stephen Strasburg's lingering Inverted W -- which has morphed into an equally bad Horizontal W -- is still an issue, the real problem is how Stephen Strasburg's shoulders start rotating while his arm is FLAT, not up.